Storytelling is a mechanism used for sharing ‘knowledge’ in the most engaging, memorable and persuasive way possible. The objective of storytelling is to share the knowledge you have acquired via data analysis with the decision makers and get your recommendations implemented in a timely manner. ‘Data’ is a set of observations (facts, figures) which have not been organized, processed and interpreted. Once the data is organized, processed and interpreted it becomes useful and meaningful. This useful and meaningful data is called ‘information’. Web analytics reports are choke full of information. However not every piece of information has the potential to drive changes within an organization and improve the business bottomline. 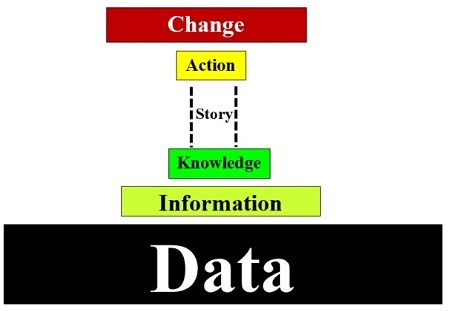 When the information has the potential to drive changes within an organization it becomes ‘knowledge’. A data analyst share this knowledge with the decision makers so that they take ‘action’ and help in driving ‘changes’ within an organization. However decision makers will act on the shared knowledge only if they understand it, see business value in implementing it and understand the cost of delaying the implementation. Data analysts share the knowledge they have discovered, using data and visuals (like graphs, charts and dashboards). They often fail to include ‘narrative’. Without ‘narrative’ (your own commentary) the data and visuals are often misunderstood or not understood. And when the knowledge you are trying to share is not understood, no actions are taken and no changes occur. This is where ‘data story’ come into the picture. When you add ‘narrative’ to ‘data’ and ‘visuals’ it becomes a ‘data story’. Many data analyst do the opposite. 60 to 70% of their data story is made up of ‘data’ and ‘visuals’ and only 30% include ‘narrative’ (if any). 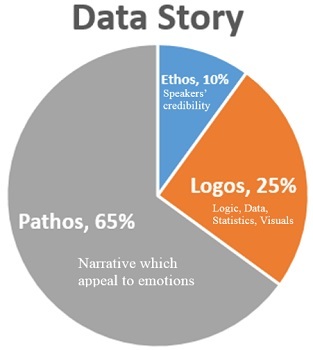 The pie chart that you see above is based on Aristotle’s three modes of persuasion: Ethos, Pathos & Logos and the result of the analysis done by ‘Carmine Gallo’ on Bryan Stevenson’s famous Ted talk ‘We need to talk about an injustice’ for which he received the longest standing ovation in the history of TED conference and managed to receive a donation of $1 million for his non-profit from the conference attendees. Ethos – credibility of the speaker. Pathos – act of appealing to emotions. Logos – means of persuasion through logic, data, and statistics. Out of these three modes of persuasion, ‘pathos’ is the most difficult mode. You need a high level of ‘emotional intelligence’ in order to appeal to emotions of the people. Unfortunately many data analyst/scientist lack ‘emotional intelligence’. They believe just presenting the raw statistics and logic would do the trick and get their recommendations implemented. But neuroscientists have proved time and again that people make decisions based on emotions and not logic. So unless your narrative does not appeal to emotions of your decision makers, it is not going to be effective. Presenting ‘data’ and ‘visuals’ is often the easy part of data reporting. Presenting the narrative is the hard bit. If your ‘narrative’ is not engaging, memorable and persuasive then it will not drive changes and you won’t be able to deliver any business value through your analysis. In order to drive changes, you need to work on delivering your narrative. You can make your narrative engaging by introducing and using real life / fictitious characters (like: ‘Sarah’ or ‘John’) and by creating a plot. Like we normally do, when we tell a story to a child. The only difference here is that, you are not a telling a ‘bedtime story’. Your story need to be believable. Your objective is not to put people to sleep. Your objective is to make decision makers get excited and implement your recommendations ASAP. Try to connect with your audience at the emotional level as soon as you can, so that they don’t loose interest in what you have to say next. What that means, do not start your presentation with raw data and statistics. Tell a story. Start with explaining the context. Decision makers are more likely to remember that leaky tap than any raw figure you presented via charts or table. That’s how you can make your story memorable. #4 Why what you discovered, is important to your target audience? What that means, do not report ‘bounce rate’ to a CEO, if you can’t figure out what action he should take on the basis of ‘bounce rate’. #5 What is the upside potential of implementing your recommendation? For example if you believe that a particular recommendation will improve orders from 500 to 1500, then the upside potential is of 1500 conversions. #6 What efforts are involved in carrying out your recommendation? How much time and money it is going to cost? Who will be responsible for carrying out this recommendation and how exactly it will be carried out? #7 What is the likelihood of success? Can you really carry out this recommendation and achieve the desired level of success within designated time frame? Back up your recommendations with strong case studies, if possible. #8 What is the cost of delaying the implementation of this recommendation? You may be telling a story but you are still presenting a business case and it must provide a business value. In storytelling, you first present the narrative and then the data and visuals to support the narrative. Use only that data which validate or enhance your discovery/findings. Use data as an evidence. Do not use data which just repeat what you have already said and which do not validate/enhance your discovery/findings. Apply visuals to data only when it enhanced your discovery or the insight can’t be delivered otherwise. Do not use visuals which just repeat what you have already said. Do not use complex visuals (lot of design elements and/or data). It is very important that in your narrative, you include a sense of urgency i.e. why your recommendation should be implemented immediately. Otherwise decision makers have got millions of priorities of their own. Why they should give your work the top priority? If there is no urgency, then your recommendation can be implemented tomorrow, next week, next month, next year. If you lack emotional intelligence, you can make up for it (to an extent) by inducing fear of monetary loss to get your recommendations implemented in a timely manner. Fear of monetary loss drive changes really really fast. Businesses do not want to lose money. Storytelling act as a bridge between ‘knowledge’ and ‘action’. You need to build this bridge in order to drive changes within your organization.